The Christian Brothers' Congregation is going to seek Non-Government Organisation (NGO) status at the United Nations in its bid to be a better advocate for the rights of children at risk. This news was recently conveyed to the brothers internationally in a joint letter signed by the Congregational Leadership Team in Rome. 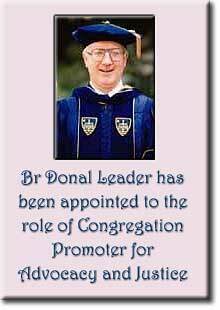 Br Donal Leader has been appointed the Congregation Promoter of Advocacy and Justice. Following is the full text of the letter which was published at Easter time. NE OF THE INSIGHTS of the Congregation Chapter of 2002 addressed the issue of A prophetic Call to a Quest for Justice. Through this Insight, the Chapter challenged the followers of Blessed Edmund to make the Quest for Justice a core dimension of their apostolic ministry. Because the Quest for Justice is such a broad issue, and because it impinges on so many dimensions of economic, social and political life in our world to day, the CLT, in its reflections on the Insight, believed it appropriate to view the Quest for Justice in the context of the Congregations charism and tradition. It is our belief that a central focus of our apostolic outreach in the area of Justice should be the welfare of Children at Risk. 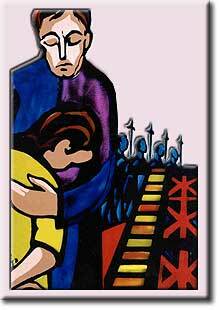 It was the plight of such children that moved the heart of Blessed Edmund when he began his prophetic work back in 1802. Children who, because of their poverty, fail to benefit from the educational and the social services provided for them. Around the congregation generally, there is much good work being done in this area. Some initiatives are the result of PLTs investing province resources in Justice Offices and personnel. Other projects are the result of individuals taking the initiative, and using their own energy and enthusiasm to address the particular needs that they believe are compelling, and deserving of their efforts. Overall, across the congregation generally, there appears to be a lack of a real focus and a lack of co-ordination. The decision of the CLT to call attention to the plight of Children at Risk is intended to bring a sharper focus and co-ordination to the excellent work of Justice being promoted in many parts of the congregation. There is another dimension to the work of Justice that up to now has not been seen as a significant part of the congregations involvment in this ministry viz. the dimension of Advocacy. Not alone is it necessary to address the plight of Children at Risk, it is also necessary to lobby for systemic change so that the root causes giving rise to the pain and misery of children can be addressed. Many of those involved in Justice ministry in the congregation are responding on a daily basis, and in very difficult circumstances, to the prophetic call to work for social justice and human development. Those who work in this field can often feel powerless and without a voice when confronted by the overwhelming forces that threaten the dignity and rights of the poor, particularly children in marginalized situations. Who speaks for those upon whom unjust structures and circumstances have imposed the silence of powerlessness? Where are the places of power and influence where the cry of the poor and the voice of the child should be heard? These are questions that challenge the Congregation to be an advocate for the rights of children everywhere. One of the ways of promoting the welfare of Children at Risk from the perspective of effective advocacy is to gain NGO status for the Congregation at the United Nations. Over the past number of years, several congregations have successfully negotiated such recognition for themselves, and because of that they are now in a position to be a voice for the voiceless in one of the most important forums of the modern world, the United Nations. NGO status is only achievable by a congregation when it has a clear focus on what it stands for, and when it is seen by the relevant UN authorities to have a proven track record on the ground in working with the people it claims to represent. In the light of the above reflections, the CLT has taken the decision to appoint Br. Donal Leader to the role of Congregation Promoter for Advocacy and Justice. In establishing this role, the CLT is providing a new focus for the justice dimension of the Congregations global mission, and an enhanced recognition of the significance of the ministry of those who struggle daily against structural and political injustice. A fundamental aspect of Donals role will be assisting the Congregation in gaining access to recognized international institutions, particularly to the relevant agencies of the United Nations, to ensure that those who work for children and the poor around the world can speak to the international community and claim justice on behalf of the voiceless. Those who work in marginalized situations can sometimes feel that they are ploughing a very lonely furrow. All too often, those who work on behalf of children and the poor around the Congregation feel deprived of access to the resources of advocacy, research, theological reflection and political analysis that can integrate the work of justice within a broader frame of reference. It is Donals intention to offer, as far as possible, this service to the Congregation at the international level. Beginning in 2006, he will seek to learn from, and reflect with, those who are active in ministries on behalf of children and of the deprived. 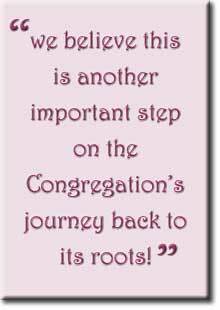 This is a new journey for the Congregation and for Donal. He will learn to walk with those who minister to the poor, and will initiate a dialogue that in time, and with Gods grace, will become a powerful voice for the silent and the powerless. When we journey we listen, we reflect, and we share. This new role and ministry within the Congregation engages with the dynamism, power and mystery of the Emmaus story on behalf of those for whom Jesus had a particular concern, the children of the world. For those who wish to contact Donal on any aspect of this new ministry to which he has been called can e-mail him at dleader@mac.com. His community address is: Christian Brothers, Synge St., South Circular Road, Dublin 8. Brothers, we believe this is another important step on the Congregations journey back to its roots. It is a tentative step, and Donal will need the support and the good will of all those who are involved in the Justice ministry within the ambit of congregation ministry. Over the next few months, he will be engaged in personal preparation and reflection. He will also be planning his process of engagement with people on the ground. It is his intention to make personal contact with as many ministry sites as possible so that he can gain first hand information on what is going on. In this way, he hopes to build up a solid network among those working for Justice so that when the time comes for him to make an approach for formal recognition at the UN, he will be in a position to draw on the wisdom and insights of those who are actively engaged in this ministry on the ground.